Thought! Mate..: Oracle BPEL PM - Dehydration Store? BPEL is the standard for assembling a set of discrete services into an end-to-end process flow, radically reducing the cost and complexity of process integration initiatives. BPEL is an OASIS standard executable language for specifying actions within business processes with web services. Processes in Business Process Execution Language export and import information by using web service interfaces exclusively. Leaders in this arena include Oracle BPEL PM, Websphere PM etc. Oracle BPEL PM utilizes a database to store metadata and instance data during runtime. The process of updating process state in the database is called Dehydration. This data is stored in what is known as the Dehydration store, which is simply a database schema (also called dehydration store, BPEL schema, BPEL tables). The Dehydration Store database is used to store process status data, especially for asynchronous BPEL processes, like BPEL’s metadata and instance data. This exists in x_SOAINFRA schema created by running RCU. This is separate and independent from any database objects used by your BPEL processes for storing application or business data. For performance reasons, the BPEL schema does not utilize foreign keys and thus master-detail relationships are not obviously inferred from looking at the schema definition.These dependency relationships are maintained by the BPEL engine. Oracle BPEL Process Manager uses the dehydration store database to maintain long-running asynchronous processes and their current state information in a database while they wait for asynchronous callbacks. Storing the process in a database preserves the process and prevents any loss of state or reliability if a system shuts down or a network problem occurs. 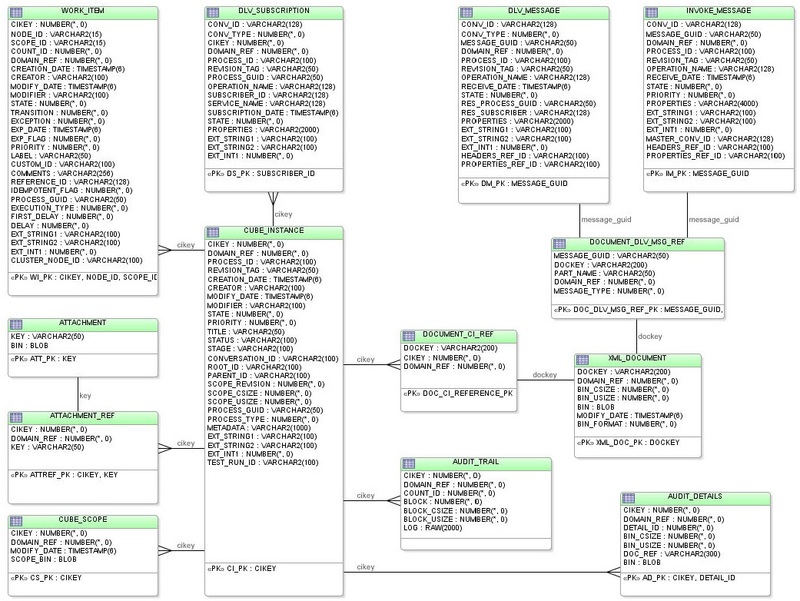 The database schema ddl can be found at: \Oracle_SOA1\rcu\integration\soainfra\sql\bpel. With proper knowledge of this schema, administrators can bypass the BPEL Console and write SQL queries against the store directly OR use BPEL Process Manager API. Oracle BPEL Process Manager Console provides a user-friendly, Web-based interface for management, administration, and debugging of processes deployed to the BPEL server. BPEL Process Manager API provides an exhaustive set of classes to find, archive, delete instances in various states, delete callback/invoke messages across different domains, or query on the status of specific domain, process, or instance. In production environments, administrators need strong control over management tasks. Via a PL/SQL query or BPEL API against the BPEL Dehydration Store database, it is possible to automate most of these administrative tasks. Class WhereConditionHelper Provides methods such as whereInstancesClosed(), whereInstancesStale(), and whereInstancesOpen(), which construct a where clause that search for respective instances. Interface IBPELDomainHandle Allows the developer to perform operations on a running BPEL process domain. Provides methods such as archiveAllInstances(), deleteAllInstances(), d eleteInstancesByProcessId(), deployProcess(), and undeployPorcess(), deleteAllHandledCallback(), and deleteAllHandledInvoke(). Interface IinstanceHandle Allows the user to perform operations on an active instance. Provides methods such as isStale() , getState() , getModifyDate() , and delete() . Class Locator Allows the user to search for processes, instances, and activities that have been deployed and instantiated within an Orabpel process domain. Provides methods such as listInstances() and listActivities() and can take where clauses as parameters. TASK table stores tasks created for an instance. The TaskManager process keeps its current state in this table. Upon calling invoking the TaskManager process, a task object is created, with a title, assignee, status, expiration date, etc. When updates are made to the TaskManager instance via the console the underlying task object in the db is changed. CUBE_INSTANCE Contains one entry for each BPEL instance created. It stores instance meta data information like creation date,last modified date, current state, process id etc. An important column is cikey. Each BPEL instance is assigned a unique ID - is the instance ID that you see in your BPEL console.Gets incremented in a sequence with creation of BPEL instances. This key cuts across a lot of tables in the dehydration tables. CUBE_SCOPE Stores the scope data for an instance. It stores BPEL scope variable values & some internal objects to help route logic throughout the flow. DLV_MESSAGE Call back messages are stored here. All non-invocation messages are saved here upon receipt. The delivery layer will then attempt to correlate the message with the receiving instance. This table only stores the metadata for a message. (eg. current state, process identifier, receive date). WORK_ITEM Stores activities created by an instance. All activities in a BPEL flow have a work_item table. This table includes the meta data for the activity (current state, label, and expiration date (used by wait activities)). When the engine needs to be restarted and instances recovered, pending flows are resumed by inspecting their unfinished work items. AUDIT_TRAIL Stores record of actions taken on an instance. As an instance is processed, each activity writes events to the audit trail as XML. As the instance is worked on, each activity writes out events to the audit trail as XML which is compress ed and stored in a raw column. Record of events (informational, debug, error) encountered while interacting with a process. DLV_MESSAGE_BIN Stores received payload of a call-back process. The metadata of a callback message is kept in the dlv_message table, this table only stores the payload as a blob. This separation allows the metadata to change frequently without being impacted by the size of the payload (which is stored here and never modified). WFTASK Stores human workflow tasks run time meta data like taskid,title,state,user or group assigned, created and updated dates. In a production environment, it will be necessary to archive the information before you delete the information—and to do so for hundreds of instances. Fortunately, you can achieve this goal using PL/SQL or EJB. 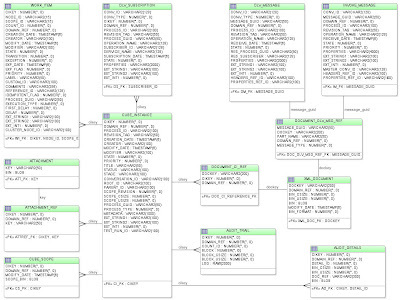 Oracle BPEL Server obtains database connections using an application server JTA data source. Oracle BPEL Server by default is configured to use the Oracle Database Lite dehydration store. For stress testing and production, Oracle recommends that you use Oracle Database 10g/11g. The same recommended when BPEL involves large attachments. Transient processes: does not incur any intermediate dehydration points during process execution. If there are unhandled faults or there is system downtime during process execution, the instances of a transient process do not leave a trace in the system. Instances of transient processes cannot be saved in-flight (whether they complete normally or abnormally). Transient processes are typically short-lived, request-response style processes. Eg: synchronous process. Instances of durable processes can be saved in-flight (whether they complete normally or abnormally). These processes are typically long-living and initiated through a one-way invocation. Because of out-of-memory and system downtime issues, durable processes cannot be memory-optimized. The asynchronous process you design in Oracle JDeveloper is an example of both transient and durable processes. A BPEL invoke activity is by default an idempotent activity, meaning that the BPEL process does not dehydrate instances immediately after invoke activities. true (default): If Oracle BPEL Server fails, it performs the activity again after restarting. This is because the server does not dehydrate immediately after the invoke and no record exists that the activity executed. This setting can be configured for each partner link in the bpel.xml file. A very good article having the best information on performance tuning. Please could you let me know to connect to the dehydration store? I'm testing a specific case: I have an asynchronous bpel process (one-way) with a catch implemented and I have configured several retries (retry policy). I wonder what happens with the execution while waiting for a retry. Is it stored in Database?, What tables are used in this case? I do not find invoke_message_bin table on local SOA server 11.1.1.5. Could you tell me what could be the reason ? Is this table replaced with someother table ?